S2O: stock market investing oriented blog | This blog is about stock analysis, value investing and investing technics. This blog is about stock analysis, value investing and investing technics. IPGP currently is in up trend, it is in a Bull market stage (Latest stock price 76.34 is above long term (200 days) moving average (MA200 is 68.37). 50 day moving average is 70.12 and above 200 days moving average.). More than that, lately it’s been traded with well above average volume, it shows a lot of interest to this stock. In terms of Technical Indicators Alert, it currently show “Hold”, because all indicators are currently in a positive territory. I think the “Buy” signal was on December 3rd, when price crossed up MA10 and MACD was finally giving the buy signal (started to form a “mountain”). At the same time RSI crossed above 50 level, which means stock started to perform better than usual. Also, I’m usually trying to draw support/resistance lines and as far as I can see, there is a strong support line at the level of 75. When I switch chart to 1 year date range (just click on “1y” button at the top of the chart), I can see that the price was staying at the 75 level and could not get up pretty much all April. Recently, it tested 75 level again at the beginning of November and on December 3rd the price finally made it through. Because previous resistance line become new support, we can see that price sort of bouncing off this level ($75) for the last few days. So, I think the good entry point for a long position was on December 3rd, when all indicators gave the “buy” signal and at price level of slightly above $75. It is very close to a support level, which usually a relatively safe entry point. 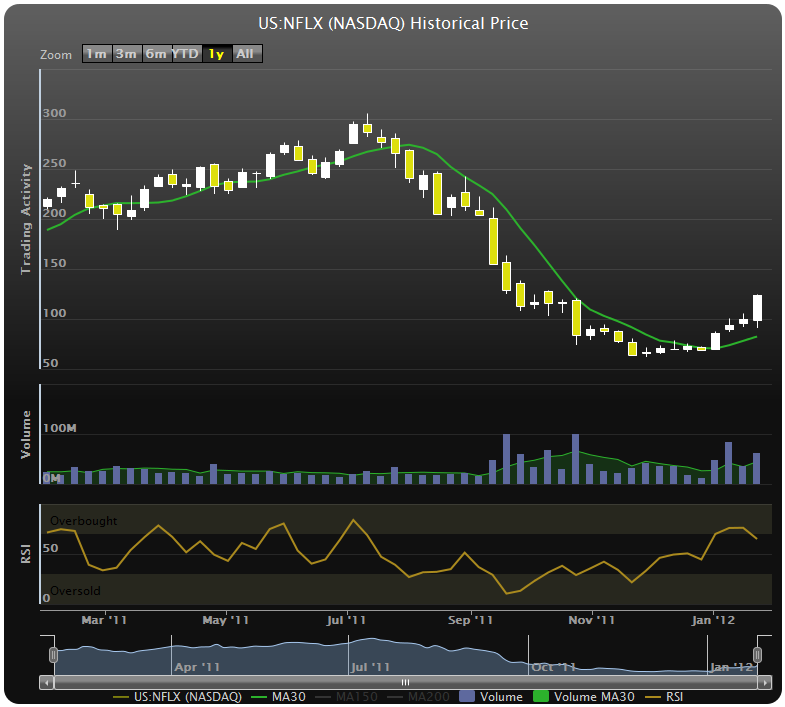 Big volume confirmed the move up and the stock is trading in the uptrend since the middle of October. All moving averages are pointing up, all secondary indicators (stochastic, MACD, RSI) are in a positive territory – I would say it is ready to go up. This is a re-post of the Mr. Harkant’s analysis originally posted on Stock2Own forum. I’m trying to keep original formatting, tables and other media prepared by the author. Mr. Harkant did a fantastic job analyzing and combining multiple sources into a comprehensive report. Enjoy the reading! Schlumberger offers technical services and products to the oil production industry. The company focuses on technology, project management, and information. The Company’s segments include Reservoir Characterization Group, which consists of the principal technologies involved in finding and defining hydrocarbon deposits; Drilling Group, which consists of the principal technologies involved in the drilling and positioning of oil and gas wells, and Production Group consists of the principal technologies involved in the lifetime production of oil and gas reservoirs and includes Well Services, Completions, Artificial Lift, Well Intervention, Subsea, Water Services, Carbon Services and the Schlumberger Production Management field production projects. Oil production is becoming more difficult. New sources of petroleum are increasingly located in remote geographic locations, such as deep-water sites off shore. Schlumberger is squarely positioned to benefit from the difficulties encountered when producers attempt to extract petroleum from hard-to-reach oilfield locations. While the energy sector has hit a rough patch, Schlumberger is a diamond in the rough. Schlumberger is the biggest oilfield-services company in the world. The source of Schlumberger’s durable competitive advantage lies in (1) the breadth and depth of the company’s products and services, which create high switching costs, and (2) the company’s global footprint (i.e., economies of scope). Schlumberger’s strength comes from its massive research and development expenditure and the geographic diversity of its portfolio that helps it to deliver superior customer solutions that are tailored to specific geographic needs. In 2012, the company spent $1.168 billion in R&D, increasing by 8.9% from $1.07 billion in 2011. Unlike its competitors such as Halliburton (HAL) that gets more than half of its revenue from North America, Schlumberger earns 68.1% of its revenue from outside of its home territory. Schlumberger is truly global with operations in 85 countries where it employs 115,000 people and operates either independently, through its associates or through joint ventures. Backed by its extensive experience and millions spent on research and development, Schlumberger has developed a new fracking (or hydraulic fracturing) technique called channel hydraulic fracturing that can reduce the water consumption by up to 60% and increase production by 20%. Today’s technique for finding oil, and bringing it to market, were all developed by Schlumberger. And throughout the recent fracking boom, the company was busy buying companies like GeoServices and ThruBit to expand its portfolio. Most of the deals it has done in the last five years are either purchases of private companies or divisions of other companies, and only get reported in the industry trade press. All of the industry’s trends serve to benefit Schlumberger further. The pending merger of Halliburton (NYSE:HAL) and Baker Hughes (NYSE:BHI) will force the sale of assets that will strengthen Schlumberger, and will weaken the balance sheet of its primary competitor, Halliburton. The fall in oil prices demands that producers buy new technology to increase supply. Power in the industry is moving toward Schlumberger technology and away from oil producers. Paal Kibsgaard is chief executive officer of Schlumberger Limited. Prior to this position, Kibsgaard held a variety of worldwide management positions including chief operating officer; vice president of Engineering, Manufacturing and Sustaining; vice president Human Resources for Schlumberger Limited; and president of Schlumberger Drilling & Measurements. Earlier in his Schlumberger career, Kibsgaard was GeoMarket manager for the Caspian region after holding various field positions in technical sales and customer support. A petroleum engineer with a master’s degree from the Norwegian Institute of Technology, Kibsgaard began his career in 1992 working for ExxonMobil. In 1997, he joined Schlumberger as a reservoir engineer in Saudi Arabia. Schlumberger’s financials are a picture of prosperous stability. For the September quarter, it earned $1.949 billion and $1.49 per share on revenues of $12.659 billion. Compare this to the $1.715 billion in earnings, $1.29 per share and revenue of $11.651 billion a year earlier. The company beat its own earnings expectations for the third quarter despite falling prices. At its current price, Schlumberger is trading at a P/E of about 16 and a yield of 1.86%. Expect that multiple to decline, and that yield to increase, as the month wears on. The company will doubtless experience some difficulties as those who pay its bills hit the wall, but it has cash reserves of $6.8 billion to cushion any blow. Therefore, like in 2012, growth in the current year (2013) will be driven by activities outside of North America. The demand for oil is continuously rising but it looks like shale gas will also have an important role to play in the future. There are new opportunities springing up in the Chinese shale gas sector. After its second round of shale gas auctions, China’s Ministry of Land Resources has announced that 16 firms, mostly state-owned enterprises, have pledged to invest $2.06 billion in the next three years on shale gas projects. Although the country is home to the world’s largest technically recoverable shale gas reserves of 1,275 trillion cubic feet or 36.10 trillion cubic meters (2009 estimates of U.S. Energy Information Administration) but the Chinese government officials have admitted that the country would rely on the technological support of Western firms to tap into its unconventional gas resources. This is where the three American oil field services firms in general — Schlumberger, Halliburton and Baker Hughes (NYSE:BHI) — and Schlumberger in particular come into play. While the economy is picking up in the U.S., the rest of the world is experiencing prolonged economic troubles. 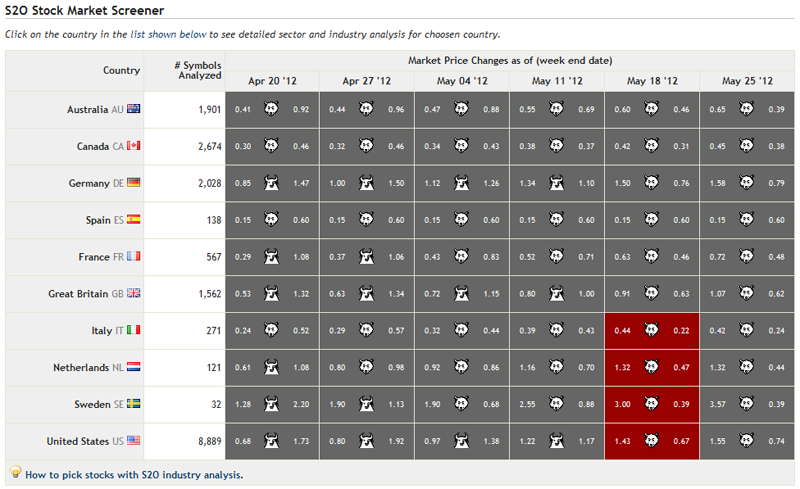 Europe, Japan, and emerging markets are still down. Russia is experiencing severe economic woes, including a currency crisis, due to western sanctions over the conflict with Ukraine and falling oil prices. The oil and gas sector comprise a disproportionate share of the Russian economy. Schlumberger has a major presence in international markets, including Russia. Global economic woes could weigh on Schlumberger’s profit margins for some time to come. While the commodity price cycle will start to reverse, it is uncertain exactly when this will happen. Oil and gas prices could remain low for a prolonged period before the cycle starts to reverse. According to thehydrocarbon.com press release from October 20, drilling activity is actually going up in the U.S. despite the crush in oil price. U.S. rig count climb continues despite oil drop. In Q3 2014 the average U.S. onshore rig count added 46 rigs (3%) to make for a total of was 1,842 rigs. When matched up with last year’s Q3, the total is up 133 rigs or 8%. In fact, in the latest week before the announcement, as oil prices have slumped, the count has still increased by another 18 rigs. A $20 drop in the price of oil has not lowered activity at all. According to Schlumberger, it continues to believe that the slow but steady recovery in the world economy is intact. While market sentiments are currently driven by fear of short-term over-supply, and although the oil demand outlook has been revised slightly downwards, the company sees a supply-demand situation that is relatively well-balanced. Furthermore, Schlumberger said on its Q3 conference call that it does not expect any decline in services despite this initial downturn in oil prices. Halliburton (HAL) and Baker Hughes (NYSE:BHI) are in the middle of a buyout/merger. Their combined company would be larger than Schlumberger Limited (NYSE:SLB), but with the expected contraction of redundancies, the combined company may end up being same size/slightly smaller than SLB. Schlumberger has been paying uninterrupted dividends since 1982, the forward annual dividend yield is at 1.68% and the payout ratio is only 29.0%. The annual rate of dividend growth over the past three years was high at 14.2%, over the past five years was at 8.3%, and over the past ten years was also high at 12.8%. I consider that besides dividend yield, the consistency and the rate of raising dividend payments are the most crucial factors for dividend-seeking investors, and SLB’s performance has been very good in this respect. Annual dividend growth may remain at around 20% over the next few years with both free cash flow and earnings payout ratios being steady. 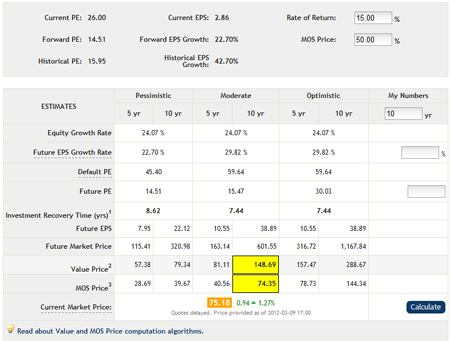 Current stock valuation has only priced in ~10% dividend growth rate. Given the current low valuation and strong dividend growth potential, dividend yield on current cost should reach 2.0%-2.6% by February 2016. As of the 2nd quarter 2014, Schlumberger has repurchased $2.6 billion under the $10 billion share buyback program. On the second-quarter conference call in July, CEO Paal Kibsgaard announced that the company would accelerate its $10 billion share buyback program thanks to its strong free cash flow. It will now seek to complete the program in two and a half years instead of the original target of five years. Schlumberger’s valuation metrics are good; the enterprise value-to-EBITDA ratio is low at 9.92, and the average annual earnings growth estimates for the next five years are very high at 16.22%. 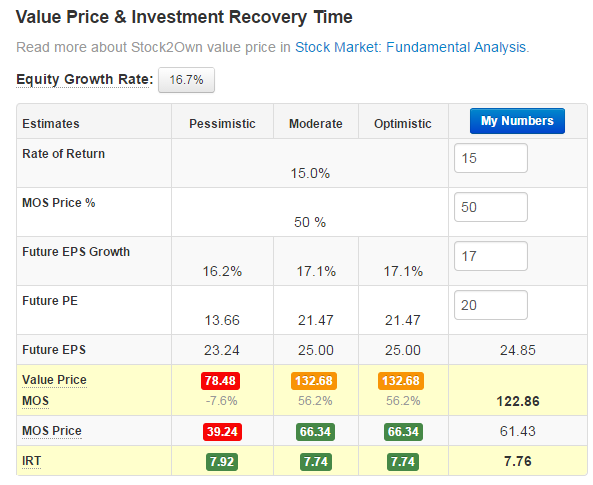 The forward P/E is at 15.03, and the PEG ratio is low at 1.05. The PEG Ratio – price/earnings to growth ratio is a widely used indicator of a stock’s potential value. It is favored by many investors over the P/E ratio because it also accounts for growth. A lower PEG means that the stock is more undervalued. 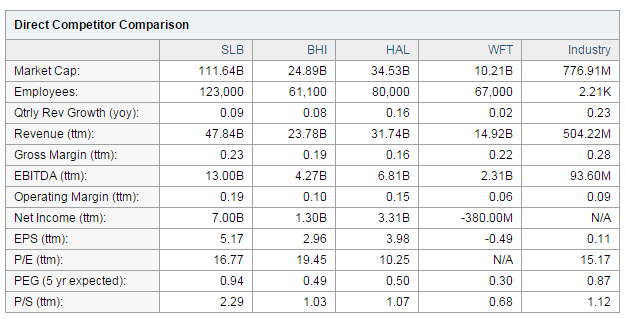 According to its historical valuation ratios, SLB’s stock is extremely undervalued. As the world’s leading oilfield services company, Schlumberger Limited (NYSE:SLB) will continue to benefit from the climb in U.S. rig count. Schlumberger has good valuation metrics, strong earnings growth prospects. The company has shown earnings per share surprise in each one of the last four quarters, and according to its historical valuation multiples, the stock is extremely undervalued. This also does not factor in the remaining approximately 7 Billion dollar stock buyback (current market cap is 110 B). Schlumberger is generating strong cash flows, and it returns value to its shareholders by stock buyback and increasing dividend payments. 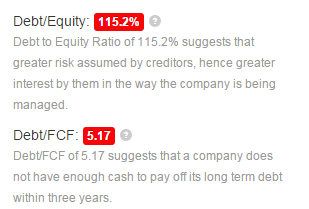 All these factors bring me to the conclusion that SLB stock is a smart long-term investment. Both Value Price and Graham Number are attempts to calculate true intrinsic value of a business. The methodologies and formulas are quite different and this is what makes it interesting – ability to see evaluations of the same thing (intrinsic value) calculated differently. It allows to see the same thing from a different angles. This is like using wireless signals to pin point a cell phone location. It is never enough to have just one signal, but if you have 3 or more signals, you can compute a location relatively good. This is what we are trying to achieve using different methodologies. I think it is wise to use different projections in different times: we may use an optimistic approach in a bullish time, while in a downturn it is better to be more pessimistic. Different people may have different risk tolerance, different objectives and different investing styles and therefore may found one or another projection type more suitable for them. I, personally, love to see all three numbers and compare them visually to see how big the difference is. If the difference is relatively small it makes me think that business is fairly predictable, at least analysts expectations are in sync with the numbers. Understanding of how similar the projected numbers are gives me extra confidence or makes me extra cautious if the numbers differ a lot. As you can see, different methodologies are using different approach for value or intrinsic price estimation. I think it is safe to say that there is no single universal formula exist. Therefore at stock2own we are trying to add more than one approach and let investor decide which one to use and to what extent. In general, when I see that all numbers are agree to each other, in other words they are on the same ballpark, it gives me higher confidence in the estimate. If I see that numbers are quite different, I have to dig dipper and carefully analyze all numbers and other aspects of a business to reach the same level of confidence in one of those estimates. 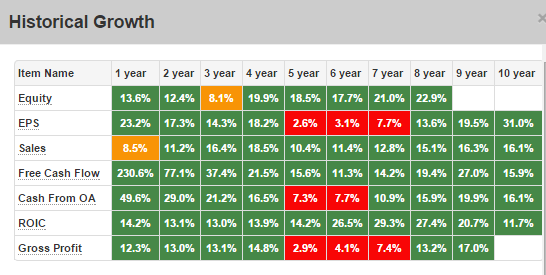 It’s been a good beginning of the year and until late March we saw pretty much all sectors were rising. 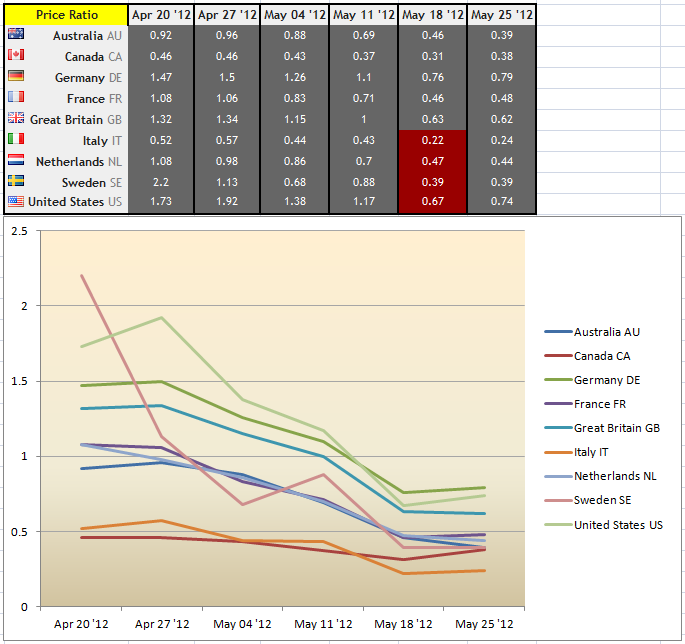 As a reflection of that, MA and Price ratios were rising too across all sectors and pretty much all countries. However, last few weeks I can see that while stock2own’s MA Ratio is still rising week after week, the Price Ratio is decreasing. I think this is due to inertness of MA (moving average). MAR is based on 150 days MA versus 200 days MA comparison – both of them are long-term moving averages. MA Ratio – ratio between number of stocks where MA150 is above MA200 (Bull or uptrend condition) and number of stocks where MA150 is below MA200 (Bear or downtrend condition). Price Ratio – ratio between number of stocks where Close Price is above MA150 (Bull or uptrend condition) and number of stocks where Close Price is below MA150 (Bear or downtrend condition). The market condition is considered Bull only if Price Ratio is greater than 1 (majority of industry/sector stocks are in a Bull market). The way I see it is we should expect MAR (MA Ratio) to be a few weeks behind. More than that, I read on several financial blogs the idea that market should be considered in a Bull or Bear condition only after 5-6 weeks of actually being in a negative or positive territory correspondingly. Therefore MAR is quite a good indicator for an overall market condition. If MA Ratio and Price Ratio are moving in the same direction, they are confirming each other. 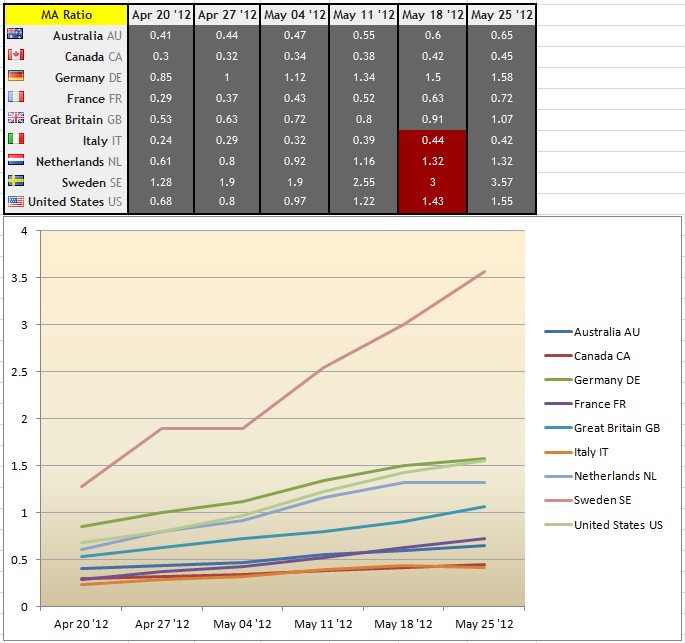 Currently we can see that PR was going lower for last 5 weeks, while MAR was still rising. I think MAR was rising because of inertness and PR gives you an early signal that not everything is as good as we want it to be. When market is going up I expect both of them (MAR and PR) rise, but now I can see sort of wave, where MAR and PR are moving in an opposite directions. Basically, it means that market is volatile. And VIX index is confirming it (rising). In general, MAR is increasing means that more companies were moving up few weeks ago. Remember, we are talking about long-term MAs – 150 and 200 days, this is almost a year! And when PR is decreasing it means that more companies have their close prices below MA150 now; technically speaking, getting into stage 4 or bear market. MA Ratio can be used as a long-term gauge of the market, while Price Ratio is a short-term gauge. Last week’s gain helped move Price Ratio a bit up, at least it stopped falling. We will see where it go the next week. I started to read posts on seekingalpha.com and I enjoy it very much. I like the whole idea of the site and admire that so many educated people are registered there as individual contributors. Several times I read there about “The Graham Number” and want to have some sort of note for myself about the subject. The Graham number or Benjamin Graham number is a figure used in securities investing that measure a stock’s fair value, named after Benjamin Graham, the founder of value investing. The Graham Number is named after a formula developed by legendary value investor Benjamin Graham. It is the maximum price an investor should pay for a stock, and it is derived using only two data points: current earnings per share and current book value per share. The Graham Number = Fair Value of a Stock = Square Root of (22.5) x (Earnings per Share) x (Book Value per Share). The math of the Graham number is relatively straightforward. It is predicated on the belief that the price-to-earnings (P/EPS) ratio should be no more than 15, and the price-to-book value (P/BVPS) ratio should be no more than 1.5.
from which the equation was created. Nice and simple! I’m going to add it to stock2own valuation. Several weeks ago we started a paper trading portfolio in Investopedia account. So far, there was only one trade – on December 12, 2011 we bought 300 shares of CELG at $63.73 a piece (read original post for details). Apparently we held this stock for almost three month and on March 6th our long position was closed by a stop-loss which was set at that time to $71.95. ROI = (71.95 – 63.73) / 63.73 = 12.89% for 3 months. It seems that stock is consolidating at the current level. It is still well above MA150 and therefore it is in Stage 3. The price may go even further up into uncharted territory if the stock will break the next resistance level at $76.09 (52 week high). Stock2own fundamental analysis saying that value price of a stock is $148, therefore we have plenty of safety here (51%) and I’m going to set a conditional buy at level $76.15 for the same 300 shares. There is also a chance that price will go down. I’m going to watch the next support level around $71.20. If it will bounce off $71.20 level, it will confirm a nice corridor between $71.20 and $76, which means that we may have pretty good ride up to $76 level if we buy stock at $72, which is almost 5% ROI. If the stock will break down below $71.20, it would be interesting to see if the price will go down to MA150 line and then bounce off – that may be a good entry point for the next run. If it will break down MA150 then I would say that CELG is in Stage 4, in other words in a down trend (I’ll make sure that we will not have long shares of CELG at that moment). Guess what they have planned for you? What were your recommendations on Sept 1 2011? I wanted to see how well they did in the third quarter. In a summer of 2007 I bought Phil Town’s “Rule #1” book. I read it and started to analyze stocks one by one, just like it was described in a book. Soon enough I realized that I need some sort of automation and created an excel spreadsheet, which did all math for me. My job was to find a stock that I like and at least partially understand, go to public web sites and copy all numbers from financial statements to my spreadsheet. Easy enough, but not too much fun especially if 19 out of 20 stocks I had to reject after I entered all those EPS, BVPS and PEs. So I was dreaming about some sort of software which will do all that copy-paste work for me. Shortly after that I started stock2own.com. At first there was only one single page, which could do just that one thing – collect all data for a single stock, calculate all numbers I was interested in and show results. Fantastic! But in a few days I realized that analyzing hundreds of stocks one by one is not very efficient. I needed something that will allow me to do group analysis; I needed something to identify hot industries and hot stocks. This is what I was dreaming about two years ago. 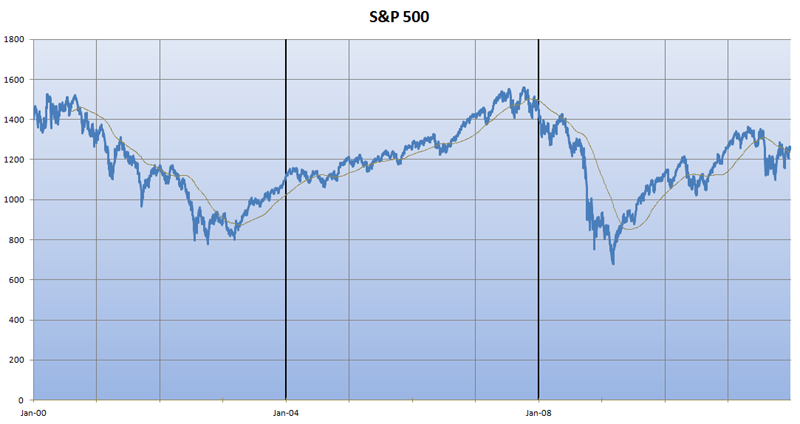 October 5, 2010 – Stock2Own launched new service “S2O Pro Industry and Stock Screeners”! One more dream came true. Now I can analyze industries, I can filter out all stocks that do not meet my criteria and focus only on those which fundamentals I do like. On top of that, price chart with some technical indicators are just one click away. What else can I dream of?! 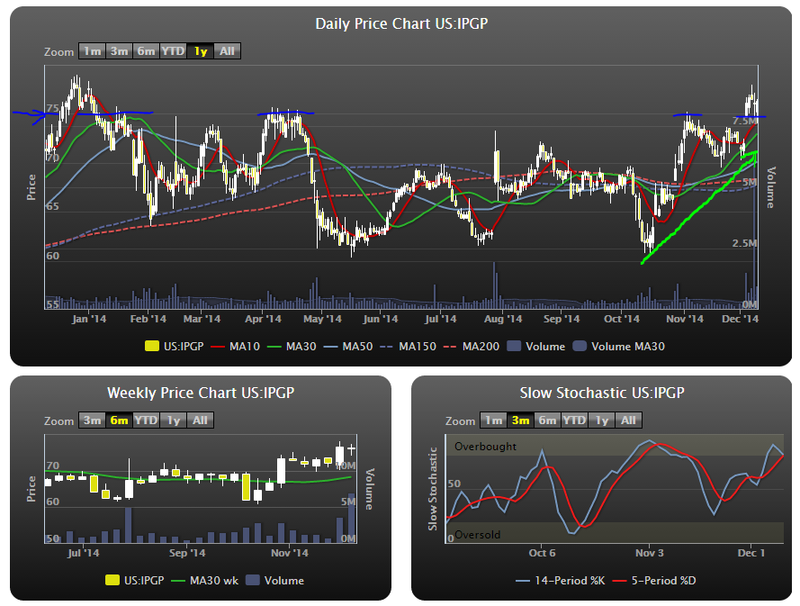 Price Charts: Weekly or Daily? Sometime ago, after I read Stan Weinstein’s book, I promised myself to never buy a stock which price is below its MA150. And I’m glad I did, because it saved me from many mistakes (I’ve made plenty of others though). I used to set a buy transaction right above MA150 and every time when I saw stock price drop lower without braking MA150 level and without triggering my buy, this rule got stronger and stronger in my head. That is why I did not buy NFLX even everybody around me were screaming about this company’s return. Well, here is a daily chart and the price is clear way below MA150 even when it moved up 20% in just one day. 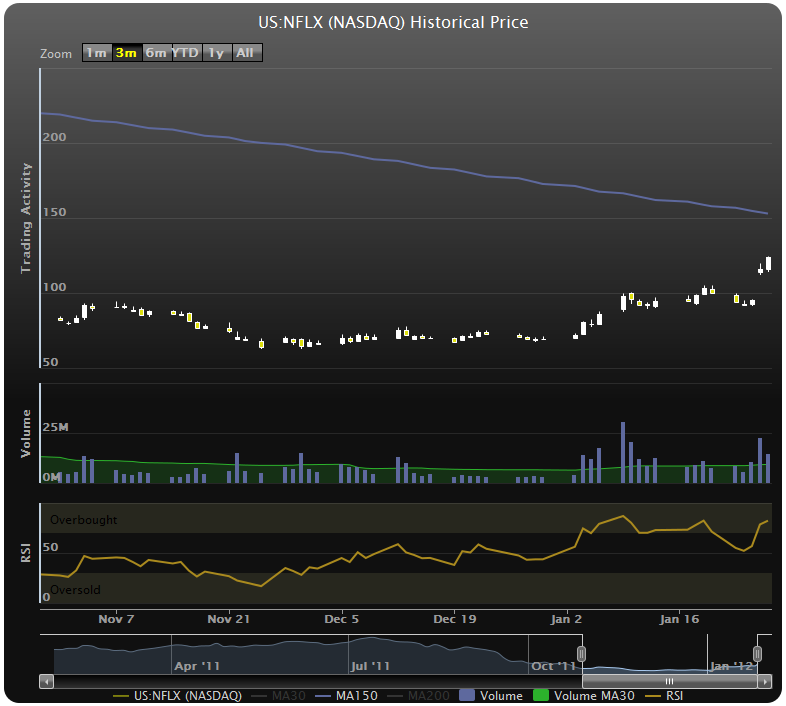 However, if you take a look to a weekly chart (shown below) you can see that weekly price crossed MA30 line 4 weeks ago. Just to make it clear, for weekly chart MA30 means 30 week MA therefore it is the same indicator as 150 days moving average on a daily chart (30 weeks * 5 days per week = 150 days). So, I think on a weekly chart it was a “buy” even when daily price is still way below MA150. 1. I should use both weekly and daily charts and even when price is below MA150 on a daily chart, but crossing MA30 on a weekly chart, well, maybe this is an early signal to buy. 2. If I got an early signal to buy, but if it is violating one of my own rules – perhaps a short-term call option will solve the problem. It minimizes the amount of money at risk and potentially can bring quite a good gain. “Regular emails help change your attitude from reactive to proactive. And with our busy lifestyles, having that gentle reminder may help us keep an eye on the prize,” says Rick Hall, RD, who serves on the advisory board for the Arizona Governor’s Council on Health, Physical Fitness, and Sports. I remember reading about recurring patterns in stock market in the Stan Weinstein’s “Secrets for Profiting in Bull and Bear Markets”. 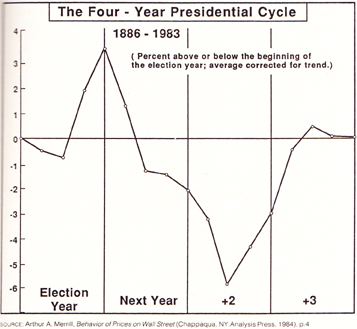 He is saying that most important pattern is “The Four-Year Presidential Cycle”. 2012 is an election year and this is a gentle reminder that based on analysis described in the Mr. Weinstein’s book, the year following the election is usually a disaster, no matter who is elected. Historically, the probabilities are strong that in the second year the bear market will continue until a bottom is reached around mid-year (as occurred in August 1982). The rest of year two is bullish, and then the third year of the presidential term is the best one of the cycle. The fourth year, which is the election year, is a choppy one, with weakness usually occurring in the first half and strength in the second half. Over the past 100 years, this four-year cycle has unfolded with such unbelievable regularity that it almost seems as if the politicians are writing a script. * Chart Publication from Stan Weinstein’s “Secrets for Profiting in Bull and Bear Markets”, originally from NY: Analysis Press, 1984, p. 4. ** Quotes from Stan Weinstein’s “Secrets for Profiting in Bull and Bear Markets”. We just started a paper trading account in Investopedia.com (user name is stock2own). By saying “we” I mean a small group of stock2own enthusiasts. The whole purpose of this is to exercise our trading philosophy, test investment ideas and gain some confidence of what we can do and what we cannot. So, ideally, we would like to have it transparent and available for everyone to view, criticize, question and follow if you wish. However, so far I cannot see how to make our trades available for you (if you know how, please, comment in this blog!). So I will post a short description of every trade here, in this blog. We will try to add a reasonably well detailed explanation of how we found a stock, why we think this is a buy or sell and so on. Option transactions are limited to simple buy/sell and Scott was really upset about that. We will see what he can do with the limited set of tools. By default each new account has $100,000 paper money to invest. So, we will try to keep approximately 5-6 securities in our portfolio at any given time. In other words, each transaction should have total cost of no more than $20,000. We are going to use fundamental analysis to select stocks and technical analysis to get in and out. 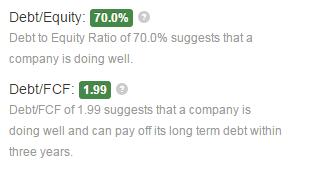 Both types of analysis we are going to do mostly using stock2own.com web site. I think this is it and here is our first trade. Stock just crossed up MA 30, both long-term Moving Averages (150 and 200 days) are pointed up. 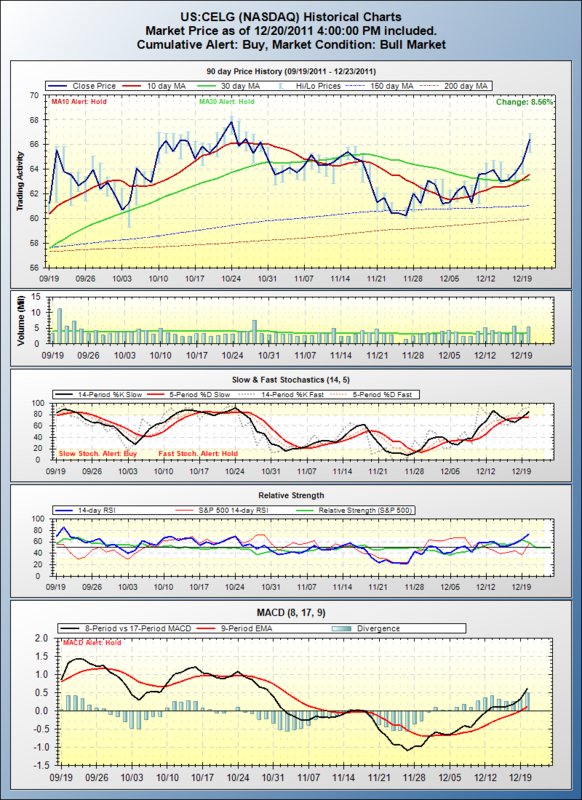 MACD and Stochastic show positive signs. RSI is just crossed level of 50 and pointed up. I set first order to be executed if the price will go higher than $64.05. Personally, I do not place orders when market is closed, because all those orders will be executed first deal in the next morning and there is always some crazy activity for the first 20-30 minutes of trading day and you never know what is going to be next… But first trade I booked on Sunday night when market was closed. Latest close price is $63.58, based on the current chart it seems that next resistance level is around $66? So, I just added some threshold for the stock, just in case if the price will go down tomorrow morning, so the trade will not be executed and we will have time to review and adjust our strategy. The next first half of day CELG price was moving down and Scott adjusted the purchase price of our order to $63.70. In a middle of the day price started to move up and out order was filled in with the purchase price of $63.73. At that point we had to book a stop-loss order with activation price in a range of $60.70 – $60.50. The chart shows support in the range of $60.70. We want to give price a bit of room to move up and down, but do not want to give up more than 5-7%, so price of $60.50 seems right. All these days since purchase, the volume of the stock is average, which means that “volume does not confirm price move up”. 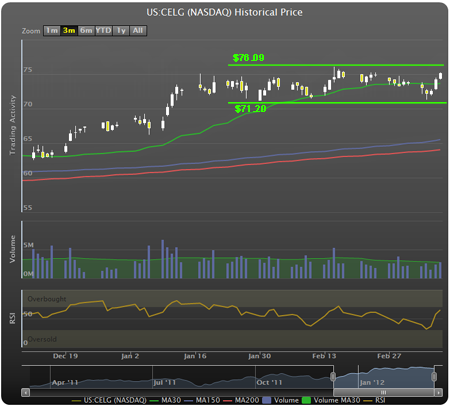 However last few days CELG price is moving up and when it went over most resent resistance line at $64.80, we moved stop-loss a bit up to the level of $63.30 (right under 30 days MA and a bit below most resent resistance line, just to give stock price a bit more room). We are looking for other prospects to buy and will keep you posted.